The development of a crush, then love, etc. Development like this should directly affect your character in the sense that they will stay dedicated to the person that they are in love with. Furthermore, it will always affect your character's actions in terms of actions that could be frowned upon by your character's partner. Relationships have a lot of amazing roleplay involved. You can roleplay grabbing lunch with your partner, getting a cup of coffee, going to the movies, cooking food for them, giving them a massage or buying them a little gift. The opportunities are endless for relationship roleplay, and it makes entire sense for your character to fall deep in love with somebody and want to dedicate their life to them. The description of a specific facial feature that your character adapts to. If you smile IRL, you don't simply smile. Your cheeks raise, your eyes adapt a positive appearance, your eyebrows raise slightly, your ears also raise. If you're roleplaying a smile, would it also be appropriate to roleplay your character blushing due to happiness? Emotion is immensely powerful IRL, so you have to take into account the exact emotion that your character is portraying through their unwilling facial expression. The development of a certain emotion within a situation or over time. As stated before, roleplaying emotion is very important. The most blatant example of how you should aim to roleplay emotion is fear. For example, if you have a gun pointed towards you, you're going to beg for your life and beg to not be shot. Roleplaying that your character was in the military and wouldn't be afraid of a gun being pointed towards them is extremely unrealistic, even men and women within the military would beg for their life if they were defenceless with a gun being pointed at them. Furthermore, women are often a lot more expressive with their emotions, so if you're roleplaying as a female you may want portray that emotion to the best of your ability whereas men may only show small signs of such emotion. If your character was harassed or abused within a certain location, they're going to be afraid to even think of that location again. If they were shot or suffered any sort of traumatic experience, the same fear would be present for that specific location. The same could be said for happier emotions; for example, if your character received their first kiss at a certain location, they might smile, blush or adapt a happy emotion from thinking or being within that location. Your character might also develop a favourite location, either out of randomness or out of contextual roleplay. The emotion of pleasure should also be roleplayed accordingly. As mentioned within the relationship example, roleplaying a massage would be beneficial for both parties. The person receiving the massage would receive immense pleasure from having their muscles relaxed, or even simply from having their skin touched. The person giving the massage would be happy to allow the person to receive such pleasure. Roleplaying that your character is sensitive to touch will often open opportunities for you to flaunt your roleplay a little. A shy character who is sensitive to touch will often blush, shiver and develop goosebumps from a light touch. Furthermore, roleplaying your character being sensitive to anything can open opportunities for you to roleplay taking large offence to words. As a very obvious example, if you're white and you're roleplaying a black character, racist terminology won't phase you in any way, but it would more than likely annoy the character and you could roleplay that accordingly. Equally, racist terminology made against a white race would have less of an effect on your black character. Roleplaying emotion can elongate for a while, however emotion is always underlying within every single action that your character takes. The development of a friendship, which will coincide with certain actions that your character takes. Being inside of a faction opens up a perfect opportunity to develop friendships. Though frowned upon, your character might develop a liking to a certain Deputy or a certain Firefighter and could then be biased towards them if in a position of power. Equally, this could be juxtaposed and your character might entirely hate somebody and want to frame them for something that could get them fired. This is a little extended, and friendship roleplay can always begin from patrolling with a certain member of a department or specifically roleplaying with a certain member of a faction that you're in to try and get closer to them and develop a liking towards them. The roleplay of actions that your character would normally take but aren't usually described. This doesn't mean you should roleplay breathing, but if you really want to develop your character, they'd wake up and make themselves breakfast. If you forget to roleplay having a cup of coffee, you'd roleplay that as your character's mistake and might roleplay them being rather annoyed throughout the entirety of their day due to that one missed cup of coffee. Furthermore, it'd be routine for a member of the Fire Department to stock up their ambulance before their shift and to check the fuel, engine oil, apparatus, etc before they begin their shift. Roleplaying a hobby, such as cycling, jogging, cooking or even skydiving can be extremely beneficial for your character. A hobby is a way of relaxing and spending free time doing something that returns a happy vibe or feeling. Your character should be excited to practice their hobbies, especially in the presence of a friend or partner. In many cases, the /attempt command will come in very handy when roleplaying competitive games such as pool or snooker. Interestingly, this command has the ability to leave you on edge for the results even IRL, which can greatly improve immersion into the game so that you can describe exactly how your character should be feeling. This list can extend for a very long time, however it's not necessary to tell you every single thing that your character can roleplay. Taking measures to roleplay things that you wouldn't normally consider essential can really, really improve your roleplay. Passive roleplay goes hand-in-hand with descriptive roleplay, and we'll come onto different roleplay styles later in this guide. In terms of roleplay, there are three main roleplay types; light, medium and heavy. RCRP functions at a heavy roleplay level, which is generally considered to be detailed, as well as externalities such as strictly enforced rules. The roleplay level of a server doesn't affect the style of roleplay that you decide to adapt to. Below, you'll find the most common roleplay types. I personally refer to this roleplay as simplistic and as though you were acting within a movie. This style involves very short /me's that briefly describe an action that can be visualised, but goes into no detail about any actions that a character may carry out. 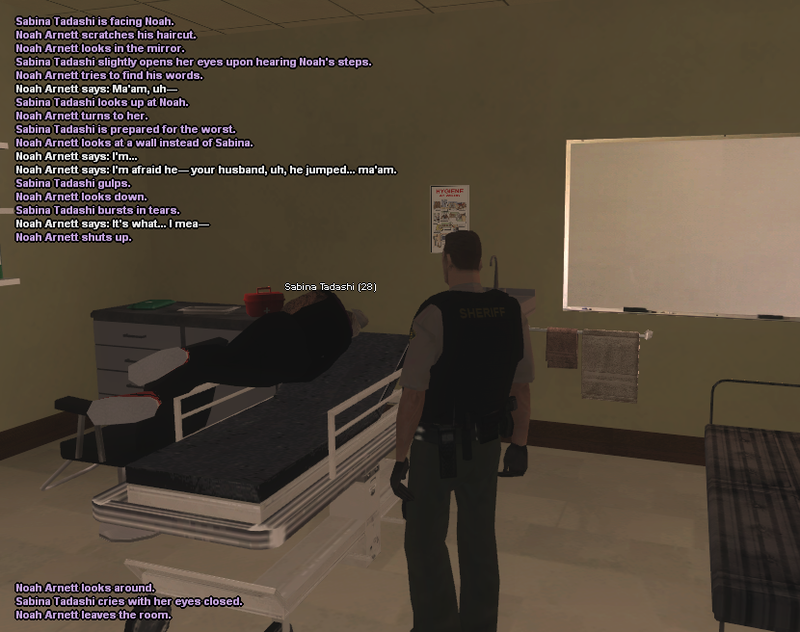 We see this style of roleplay deployed within other heavy roleplay servers, such as LS-RP which causes some people to not consider LS-RP a heavy roleplay server, however it's seldom used within RC-RP due to the level of detail that this server adheres to. If you use this style of roleplay, you're probably into movies, TV shows and visual representations of what you're trying to roleplay rather than detail. This style of roleplay is used by Khaleesi within his character stories and general roleplay. I personally refer to this roleplay as detailed and as though you were acting within a book. It involves long /me's, or roleplay that goes in-depth about certain actions in order to give all parties the sense of reading and immersing within a book. This roleplay is much more catered to RC-RP, and those who use this style of roleplay are more than likely into reading texts. If you roleplay like this and you're not interested in books, you should try getting into reading! I personally use this style of roleplay, as well as most other community members such as Beth, Fritz and even TommyB. Harriet Starborn drinks her coffee. Harriet Starborn raises her cup of coffee to her lips. She takes a sip from it before lowering it back down. Harriet Starborn holsters her shooter. Harriet Starborn slips the barrel of her Glock 17 into her holster, securing it via a strap. Harriet Starborn gives him a pat down. Harriet Starborn begins running her hands down the male's loose clothing. She continues down his arms, then his torso and legs, giving him a brief frisk around the crotch before straightening herself again. Harriet Starborn grabs his gun. Harriet Starborn quickly grapples onto the firearm stock and snatches it from his grip, pulling it away from him. Harriet Starborn checks their pulse. Harriet Starborn applies her index and middle finger onto their carotid artery, applying light pressure as she counts their pulse for roughly 60 seconds. MSR and LSR is something I created to help me differentiate between the two general styles of roleplay within the server, though you might have a different way of categorising your roleplay or other people's roleplay. You should find your roleplay style before attempting to develop with passive roleplay. If you try and force a style of roleplay onto yourself, you'll dislike passive roleplay and development and you'll simply not enjoy the roleplay. You might want to combine the roleplay together, though you might feel more comfortable with movie-style roleplay being acted in /ame rather than /me due to the length of it. Passive roleplay is one of the most fun and immersive things you can possibly do on a roleplay server, but you just have to find what you're good at and what you enjoy roleplaying, as well as figuring out your style of roleplay. A character story is one of the best methods of documenting your own personal roleplay and showcasing your development, especially to keep a track of your character's progression. Hopefully this guide will assist those seeking assistance in passively roleplaying, any feedback or criticism for this guide is greatly appreciated. About time someone made this. Good job.. It's sad that people roleplay only to be seen.. Rather than let loose and develop your character. Can i develop a relationship with you? ?